Five times a year my mentor and beloved friend Miranda Gray sends a powerful transmission of energy to women all over the world. It’s called the Worldwide Womb Blessing, and it’s happening again on October 5. So for this month’s full moon meditation, I’m once again holding a virtual Womb Blessing circle to guide you step-by-step to receive the energies. October’s full moon holds additional significance because here in the Northern Hemisphere it’s the Harvest Moon: the closest full moon to the Autumn Equinox. The Harvest Moon got its name because it provided the light farmers needed to harvest their summer crops. This year the Harvest Moon is also really close to Canadian Thanksgiving: the perfect time to acknowledge the gifts we’ve been given and express our gratitude. 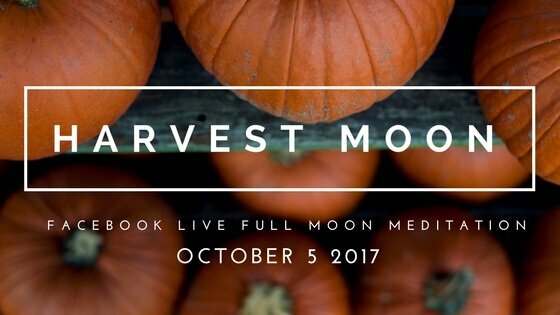 I’d like to use this Harvest Moon, in partnership with the Worldwide Womb Blessing energy, to reap our own kind of harvest. What wisdom and power lie within your womb, yearning to be harvested? ===>> Join our virtual Womb Blessing circle. We’ll be connecting with over 160,000 women worldwide, all of us awakening the Sacred Feminine within ourselves and within the World–together! Happy Canadian Thanksgiving! I can’t wait to harvest our womb blessings together.